Please mention you used our blog to find your vegetarian/vegan place to stay, when making an enquiry or booking. Thanks! We are in the French Pyrenees, just 10minutes from Hautacam and surrounded by UNESCO World Heritage sites and National Parks. We are perfectly situated for people wanting to explore the mountains, or jut come to relax. My husband is a mountain leader and fully qualified to take out clients into the mountains, rock climbing, mountain biking, orienteering and mountain walking/trekking. La Maison d’en Bas is a recently-restored guest-house, located in the village of Etsaut, approximately 50 metres from the central village square and 50 metres from la Maison du Parc (information centre for the Pyrenees National Park). All food is vegetarian (with vegan options available): breakfast and evening meals are served in the dining room on the ground floor, or if the weather allows, guests can also eat their meals in the back garden. Auberge St Pastous is our small BnB in the Hautes Pyrénées region of France. We are a great place to stay for short or long breaks or even to pop in for a tea or coffee and home-made cake when you are in the region. We have 3 lovely comfortable rooms all with stunning views, one with a huge private terrace. This is a fantastic area with lots to do if you love the outdoors but also a wonderful place just to relax and enjoy the scenery. Saint Pastous is a tiny village on the lower slopes of the Hautacam mountian, ideally situated in a rural environment but within easy reach of main roads. We love meeting people and sharing experiences over our home cooked vegetarian food prepared by David who has the Cordon Vert Diploma from the Vegetarian Society UK. We would like to welcome guests to Les Quatre Puits for self-catering Gîtes, Bed and Breakfast, Vegetarian evening meals and weekend breaks on our lovely rural estate in South West France. The beautiful house is set in its own 85 acre estate of pasture and woodland of oak, chestnut and pine. It is bordered by a river, Le Palais, and guests are welcome to walk through the estate and enjoy the natural calm. La Hierbabuena is a bed and breakfast situated in Kercorb, a valley in the foothills of the Pyrenees in the heart of Cathar country. La Hierbabuena is an eighteenth-century town house which has been fully restored in keeping with its original architectural style. The house is situated in the centre of Chalabre (the capital of Kercorb), a pleasant picturesque village which has all the usual amenities. All our meals are vegetarian, mainly based on traditional Mediterranean cooking but with culinary influences from all over the world. UTLT is one of those special places where you feel immediately at home and warmly welcomed with a personal approach from your experienced & professional hosts Nikki Emmerton and Sean Williams. 10 years in the business, and getting better all the time! Relax and recuperate in UTLT’s friendly atmosphere and zen surroundings, and take the time to enjoy its many facilities, the staggering views, the gorgeous homemade food, the great conversations, the easy going attitude and the very good company! 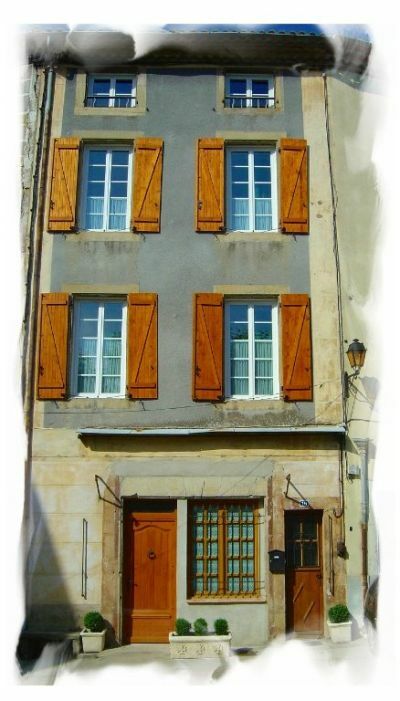 We would like to welcome you heartily in our characteristic house, Domayne les Rues, in France, in St. Bonnet la Rivière. It is one of the oldest houses of the village, which is situated in the south of ‘la Corrèze’, near ‘la Dordogne’ and ‘le Lot’, about 20 kilometers above Brive. Our house offers you nice, attractive rooms, a dining room and a living-room. In the garden, under the more than 150 year old oak, around the house and the swimming pool, you will find several lovely spots, where you can dream quietly in a (deckchair) or a hammock. La Maison du Vert is a Vegetarian & Vegan Hotel and Restaurant in Normandy, France. Situated in a stunning valley with 3.5 Acres of beautiful landscaped gardens, we are the perfect place to come for a relaxing holiday or short break. Our Vegetarian and Vegan restaurant has a delicious international menu using ingredients from our own gardens. Our drinks menu features a wide range of French Organic Wines,local Organic Ciders and Organic French Beer. We have 3 lovely rooms in the hotel and we also have a cottage in the hotel grounds ‘La Petite Maison Blanche’ which sleeps up to 6 people. We have put together a map of Vegetarian and Vegan places to stay in France. Let us know if you want to be added to it, or if you think we have got it wrong . There is also a list of all the vegetarian/vegan places to stay in France, below. If you run a vegetarian or vegan guest house, hotel or gite, in France and you would like to be listed (or if you are listed but would like to take advantage of having a full description on this page +photo) on this site please email us (contact@vegetarianandveganfrance.com).